Gingivitis ("inflammation of the gum tissue") is in response to bacterial bio-films (also called plaque) adherent to tooth surfaces. In the absence of treatment, gingivitis may progress to Periodontitis, which is a set of inflammatory diseases affecting the tissues that surround and support the teeth. Periodontitis involves progressive loss of the alveolar bone around the teeth, and if left untreated, can lead to the loosening and subsequent loss of teeth. Periodontitis is caused by microorganisms that adhere to and grow on the tooth's surfaces. In the Sahihain, it is narrated that Prophet Muhammad Sallallaho Alaihe Wasallam said : “If it was not for the fact that my nation would not be able to bear it, I would have ordered them to use Siwaak before every prayer”. In addition, in the Sahihain, it is also narrated that: “Whenever Prophet Muhammad Sallallaho Alaihe Wasallam would wake up at night, he would clean his mouth with Siwaak”. Bukhari narrated that Prophet Muhammad Sallallaho Alaihe Wasallam said : “Siwaak cleanses the mouth and pleasures the LORD (Allah)”. Sahih Muslim narrated that whenever Prophet Muhammad Sallallaho Alaihe Wasallam would enter his house, he would first use the Siwaak”. Whoever will use SIWAAK in this fashion, will be definitely protected from gum & teeth problems Insha'Allah. Sunnah of Siwaak is commonly seen among men, but women do not have a habit of Siwaak, it is necessary both for men & women, even our children should be trained to use Siwaak. Hijamah on the head drains out the un-necessary fluids & it is beneficial for all problems related to ENT. In addition, we have observed that head's Hijamah also drains the gums & protects from root canals. 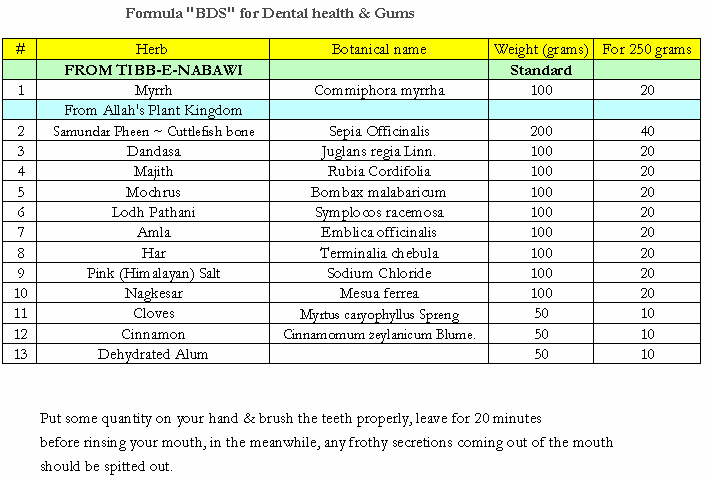 With "Myrrh" from Tibb-e-Nabawi, other herbs are combined in formula "BDS" which is the toothpowder for Gingivitis, if used daily, it stops the bleeding from gums, cures sensitive teeth, cleans the tongue & when used daily, it can reduce the plaque within 3 months Insha'Allah. "BDS" should be used at least twice daily, & its best application is before going to bed. Take some amount on your hand & using a tooth brush, rub it on your teeth & gums properly, do not rinse the mouth immediately & leave the powder on your teeth for 20 minutes, any froth formed should be spitted out. Rinse your mouth after 20 minutes & avoid any food / drinks thereafter. The herbs effect will stay on the teeth overnight & you will have the best results. Designed by Noble Systech (P) Ltd..